Happy Labor Day to all and hope every one is doing something fun today. We are actually having a bit of a rainy day here in San Diego- very unusual weather for us this time of year. I also wanted to wish a Big Happy Birthday to my daughter Kayleigh who turns 25 today. Hard to believe that I have a 25 year old daughter! This week I am working on my September UFO- Scrap Happy. I have all the pieces cut out and am almost finished with putting together the blocks- there are only 113 of them! When this bad boy is finished, it will go to the front of the quilting que as it will be going on my bed. See what everyone else is working on at Patchwork Times. Have a great week everyone! 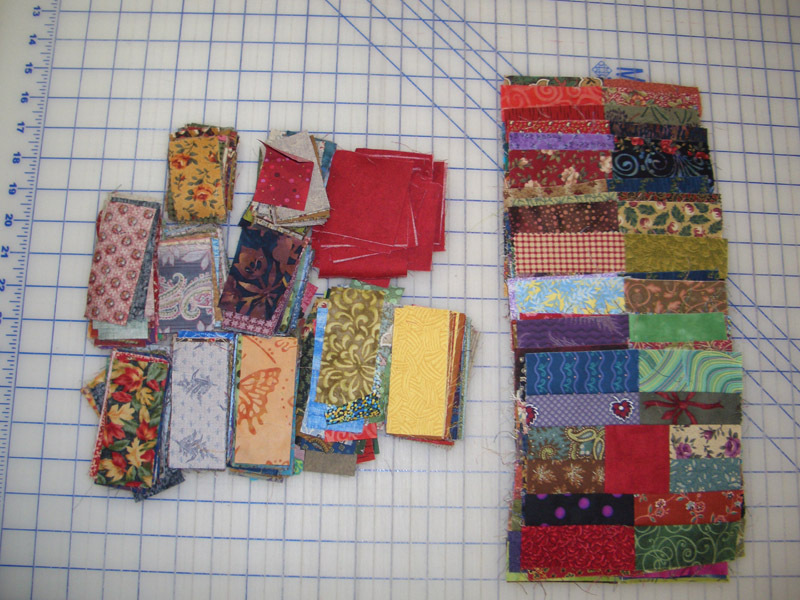 Looks ambitious--it will be a happy quilt! Oh, can't wait to see how this progress! It's a great quilt and I love your fabrics! Looks like it will be a special one. This one will keep you busy for sure. Happy belated birthday to Kayleigh. oh Its so nice to see someone working on this quilt! Its one of my favorites I have made. please share it when your done!